Incredible views, bundled golf membership, homes, estates, and condos of all sizes – what more could you want in beautiful South Naples? At Naples Heritage, you get all this and more. You get the peace of mind of living in a luxury, gated community, as well as the convenience of being just down the road from I-75. You get the fun and recreation of the 15,000 square foot clubhouse and all of its incredible amenities. You get championship golf with no hassle. And you get comfortable living in some of the finest homes and condos in the city. The single family homes at Naples Heritage are perfect examples of a union of comfort and luxury, while still offering unheralded affordability. 18 incredible floor plans are available, ranging in size from around 2,000 to more than 3,500 square feet, giving you a huge number of options and assuring that the perfect fit for your next home is in Naples Heritage. The Martinique plan, for example, offers 3 bedrooms on 2,104 square feet of living area as well as a private pool and spa. Or, take a look at the Pebble Beach layout, which feature four bedrooms, a spacious lanai, a cozy breakfast nook, and much more. The attached Villas of Naples Heritage are just as incredible. Four large floor plans are available to choose from – Ashmor, Brittany, Cheshire, and Devonshire – each coming with their own personal touches and features. Ranging in size from 1,500 to 2,100 square feet, these villas were mostly constructed in the late-90s and offer private, two-car garages, spacious screened lanais, and incredible heated pools. Three unique neighborhoods of mid-rise, two-bedroom condominiums are located in Naples Lakes – Terrace at Arbor Lakes, Terrace at Stoneybrook, and Terrace at Prestwick. Floor plans for these residences range in size from 1,200 to 1,400 square feet and feature state-of-the-art amenities, beautiful designs, and a comfortable and convenient architecture. The Ashbury floor plan is a spacious, two bedroom layout that features an open living room/dining room setting as well as an intimate lanai. The Brookside floor plan includes a large master suite, a dinette, and a lanai, while the third layout, Colonade, features two bedrooms, a gorgeous kitchen, and a lanai with incredible views of the Southwest Florida landscape. 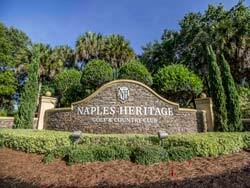 Opened in 1997, the stunning, Gordon Lewis-designed golf course at the Naples Heritage Golf and Country Club is a staple of the community, and its clubhouse is a main focal point of fun activities and luxurious recreation. Playing up to 6,600 yards from the back tees, the golf course was designed with every player in mind, and features 7 unique tee boxes from varying lengths to accommodate players of every age and skill level. Strategically placed bunkers, landscaping, fairways, and green ensures that you’ll never play the course the same way twice – and you’ll want to play it much more often than that! Plus, the greens underwent a successful renovation in 2005 during which Champions grass was introduced, a microturf Bermuda grass variety that reduces grain and provides a smooth, true roll on every putt. Membership to the club is bundled in when your purchase your new home at Naples Heritage, so you won’t have to worry about initiation fees, and while you’ll only have to pay a minimal cart fee as a member, walkers are allowed after 4 P.M. Naples Heritage Golf and Country Club truly provides an exceptional golf experience for everyone. For all the tennis lovers out there, Naples Heritage is the place for you – 6 courts, located throughout the community (4 near the clubhouse and 2 in other neighborhoods), are available without pay to any residents. Plus, they are designed and maintained with a softer surface that is easy on knees and ankles. The active Tennis Association organizes many events, leagues, clinics, private lessons, and more during the season, or you can simply hop on a court for a casual game with friends. Either way, you’ll be having fun and staying healthy right outside your new home. But it’s not just about golf – one visit to the majestic, 15,000 square foot clubhouse and you’ll be wowed by the elegant dining rooms, the comfortable grille room overlooking the 9th and 18th greens, and the many amenities and activities offered by the club. You can enjoy a Sunday breakfast year-round, a sumptuous lunch 6 days a week, and delicious dinners 5 nights a week in season. Plus, countless social events are planned throughout the year that put an emphasis on enjoying good food, each other’s company, and everything else the club has to offer.